North Cascades Crew welcomes youth ages 13 to 18 in Snohomish County! North Cascades Crew Junior program has 5 sessions/year: Spring, Summer I, Summer II, Fall and Winter (indoors/gym) on Mondays, Tuesdays and Thursdays. Land training is incorporated into the Fall and Spring training schedule. Message us on Facebook page to be alerted or send us an email to inquire about the next Try Rowing Day event. NCC takes safety seriously on and off the water. All NCC coaches are certified by USRowing SafeSport. Juniors are required to sign and uphold the NCC Code of Conduct. Junior Crew is paid per session on our website Registration page. There is no annual fee for Juniors. Your team t-shirt is included in the session registration fee in addition to the option to participate in a full crew scrimmage. 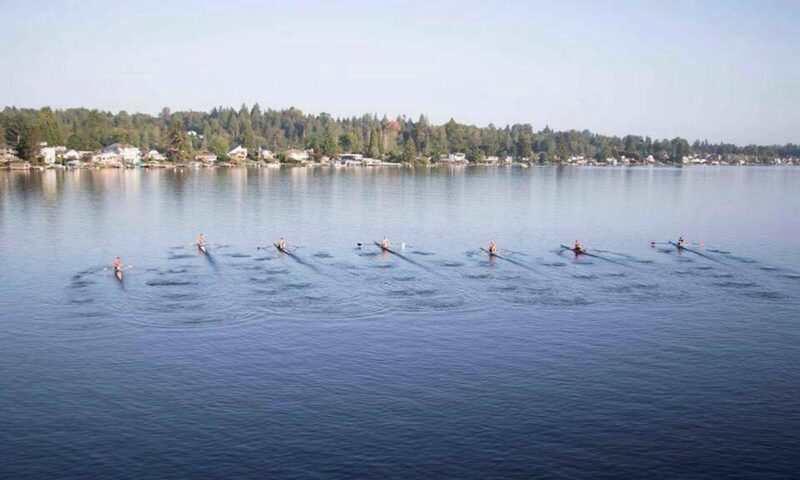 Juniors may row for recreation or choose to train for local and regional regattas. In the Fall and Spring seasons, Juniors can compete in 2-4 regattas, with an average cost of $65 each regatta. Juniors who participate in fall and/or spring sessions, must have an active US Rowing Championship Level Membership ($45) before their first day. Simply register here: http://www.usrowing.org/membership/ and email your member number to the Junior chairperson. Junior rowers must complete a float test and return the form, signed by a certified lifeguard, prior to taking a seat in boat. If not completed/passed it is your responsibility to provide a proper fitting life vest for your rower to wear while they are on the dock and in a boat. You will receive the float test form by email, with the full enrollment packet, once your registration payment is received. North Cascades Crew is a community based organization and our Juniors program relies on its many volunteers. Juniors and Juniors parents are encouraged to join Master rowers for volunteer opportunities such as driving a boat, sprucing up the local park, regatta photography, fundraising events, marketing – and more! NCC requires 10 hours of volunteer time, per session, for Juniors enrolled in spring and fall sessions. Winter gym training and the summer sessions do not have a volunteer requirement. Volunteer time not completed during Spring and Fall will be invoiced after the at $6.50/hr. Give us a ring at 1.888.ROW.NCC1 or send a note to northcascadescrewrow@gmail.com if you have a question. We’re here and happy to help!